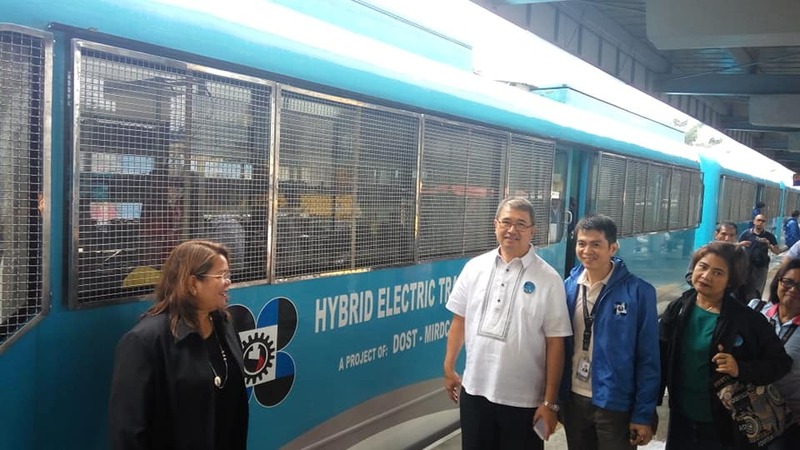 MANILA -- The Department of Science of Technology (DOST) is giving the public the opportunity to experience and try a Filipino-made hybrid electric train (HET) as part of the observance of the National Science and Technology Week (NSTW) on July 17-21. With this year's NSTW theme, "Science for the People: Innovation for Collective Prosperity", DOST Secretary Fortunato Dela Peña said the agency wanted to highlight how technologies could benefit the public, by letting them experience and discover more about these through various exhibits, fora, and demonstrations. Dela Peña and other DOST officials on Thursday led the HET's demo run from PNR Dela Rosa station to PNR EDSA station and vice versa. Everyone was welcome to try the ride for free. * PNR Dela Rosa to PNR EDSA - 9:25 a.m. to 9:31 a.m.; 10:40 a.m. to 10:46 a.m.
* PNR EDSA to PNR Dela Rosa - 9:32 a.m. to 9:38 a.m.; 10:47 a.m. to 10:53 a.m. The HET was developed by engineers from the Metals Industry Research and Development Center (MIRDC), an attached agency of the DOST. It was first introduced to the public in 2016. Just like other DOST projects, the HET is open for further tests and development and for firms to adopt the technology. According to the MIRDC, the HET is energy-efficient, since it is powered by batteries thus, less carbon emission. The train, which can accommodate 220 passengers, can run at a speed of about 50 kilometers per hour.